As splendid now as when it opened to great fanfare in 1926, the InterContinental Mark Hopkins San Francisco is one of the city’s finest hotels. Situated at the crest of illustrious Nob Hill, and at the crossing of three cable car lines, this venerable landmark is minutes from Union Square, Chinatown, and the Financial and Theater Districts. Fisherman’s Wharf and the Golden Gate Bridge are just short drives away. Historic charm combined with modern technology provides the starting point of an experience unlike any other. 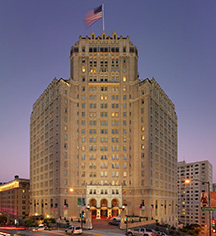 Offering 380 guestrooms, including 39 suites, all rooms face outward, boasting spectacular views of the city or bay. The hotel’s five specialty suites are reminiscent of a fine home or estate, with each furnished in a unique style, filled with luxury appointments and original art representing the city’s diverse cultural heritage. The InterContinental Mark Hopkins San Francisco is also home to the legendary Top of the Mark sky-lounge, famed for its panoramic vistas, the 100 Martini’s menu, and some of the best live entertainment the Bay Area has to offer. Steeped in rich history, the lounge has continued to draw locals and visitors alike since its opening in 1939. Guests at the pet-friendly and smoke-free Mark Hopkins also have access to around-the-clock in-room dining, a 24-hour fitness center and business center. For over 80 years, this grand dame has been world renowned for its luxurious accommodations, impeccable hospitality, and unparalleled amenities. During World War II, the Top of the Mark lounge was a favored place for Pacific bound servicemen and their sweethearts to meet before getting deployed. Adjoining Rooms: Adjoining rooms are available. Please notify request at time of bookings. Cancellation Policy: Allowed until 6:00 p.m. local hotel time. 24 hours prior to arrival. Deposit: All reservations require credit card guarantee due at time of booking. Deposits are rate dependent. Hotel/Resort Fees & Taxes: Taxes: 16.45%. Occupancy Restrictions: All room types are restricted to three people. Pet Policy: Service animals allowed: Yes. Pets allowed: Yes. Maximum weight: 25lbs. Fee: $50 per night. Transportation: Complimentary town car service (weekdays), may be arranged through the concierge; rates apply. As splendid now as when it opened to great fanfare in 1926, the InterContinental Mark Hopkins San Francisco is one of the city’s finest hotels. Situated at the crest of illustrious Nob Hill, and at the crossing of three cable car lines, this venerable landmark is minutes from Union Square, Chinatown, and the Financial and Theater Districts. 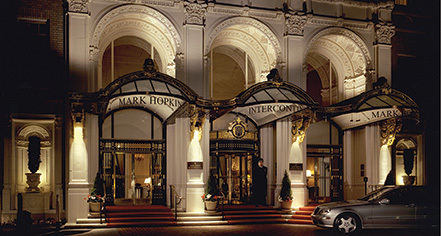 Learn more about the History of InterContinental Mark Hopkins Hotel .